A process to which metal is heated then cooled in order to remove stresses or soften material for improved machinability or formability. 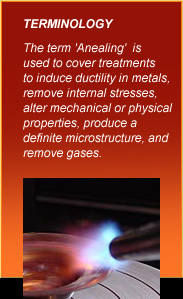 There are ten different forms of annealing - each with its own specialty and purpose. Tri-State Flame will recommend and help select the best form to optimize your results. Low temperature anneal typically used for material (ferrous or nonferrous) that is going to be reworked via cold rolling or drawing. This type of anneal is also applied to material to improve formability for forming/bending operations with reduced risk of distortion associated with intercritical or full annealing. Annealing process conducted at a temperature below the lower critical for ferrous material and below the full anneal temperature for nonferrous materials. Also referred to as process annealing. This anneal is used to restore ductility to the material for subsequent cold-working/forming operations. Annealing process typically applied to ferrous material heated to and held at a temperature between the upper and lower critical temperatures for ferrous materials. Annealing process conducted at a temperature below the lower critical for ferrous material and below the full anneal temperature for nonferrous materials. Also referred to as process annealing. This anneal is used to restore ductility to the material between cold-working or hot-working operations. Annealing process typically applied to cold-worked material to reduce residual stresses and recover ductility in the material. Temperatures used are below those required for recrystallization or new grain formation. Annealing process typically applied to cold-worked metal to produce a new grain structure without going through a phase change in the case of ferrous materials. Annealing process for ferrous materials partially of fully austenitize, followed by slow cooling to below the lower critical temperature and held for transformation to a soft, coarse pearlite(aggregate of ferrite and iron carbide). Annealing process for ferrous materials(medium to high carbon, low alloy steel) to produce a structure of globular carbides in a ferritic matrix for improved formability and machining. Annealing process for ferrous and nonferrous materials for produce the softest, stress-free structure for improved machinability, cold-workability, mechanical or electrical properties, and dimensional stability. For ferrous materials, heat to above the upper critical transformation temperature and hold to obtain full austenitization, and slow cool to ambient temperature. For nonferrous materials, heat at the specified alloy anneal temperature, hold for a specified time, and furnace cool to ambient temperature. Annealing process for ferrous and nonferrous materials to produce a solid solution of alloy elements for age-hardening or precipitation-hardening, or improved machining, formability, and/or corrosion resistance. This process is comprised of heating to a specified temperature, holding for a specified time, and cooling rapidly to ambient temperature. This process is typically the precursor to an age-hardening operation for precipitation - hardenable alloys.